This month two lucky winners will each receive a pair of the brilliant AeroChill Cooling Boots, courtesy of Treehouse Sporting Colours. Winning a BETA Innovation Award in 2016, AeroChill Cooling Boots work by evaporation. Rather than pushing cold into the legs like traditional ice boots, they draw heat away, which accelerates recovery time after exercise, cools body tissue and regulates outer thermal temperature. 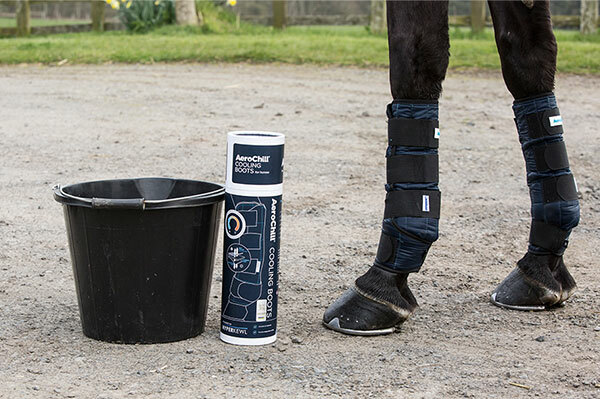 Simply soak them in cold water to activate the Hyperkewl technology, fit them to your horse’s legs and leave the boots to work their magic for 30 to 40 minutes. This evaporative cooling technology is used worldwide by elite clients, such as Formula One drivers, athletes and Military Special Forces, to keep them cool. Available in sizes S, M and L, from £39.95 per pair. For more information on the AeroChill Cooling Boots visit: www.treehouseonline.co.uk or tel: 01299 851625. Register down below for your chance to win! Sorry. Registrations are closed for this competition.